Edrioasteroids are rare, beautiful, and popular fossils to collectors and professional paleontologists. They show their affinities with other echinoderms in having obvious pentaradial symmetry (structures repeat in a circle 5 times). Here’s a perfect Streptaster vorticellatus (Hall, 1866) edrioasteroid from the Cincinnatian outcrop belt of northern Kentucky, USA. It is encrusting a hardground (the same hardground horizon that has produced abundant specimens of the hyper-rare edrio. Carneyella ulrichi). 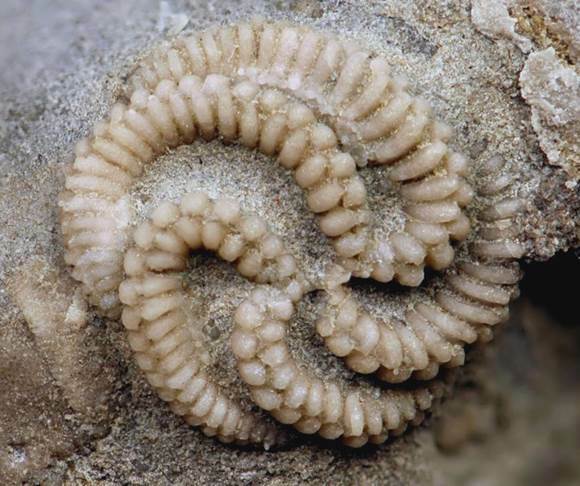 Streptaster vorticellatus (13 mm across) from the Bellevue Formation (Upper Ordovician) at the Maysville West roadcut of northern Kentucky, USA.